Home» FAQ » What is a merchant account? Simply, a merchant account allows a business, online or brick and mortar, to accept and process credit cards, debit cards, and electronic checks. The merchant account establishes the relationship with the merchant processing company (us!) so that the business can swipe, manually enter, or collect on a website the credit or debit card and the payment can be processed. The merchant processing company instantaneously checks the status of the card holder’s account and verifies the payment. Then they process the payment and deposit the funds into the business’ account. A small fee is charged for the processing with all merchant accounts. The rates for merchant accounts and virtual merchant accounts varies from company to company, however we guarantee the lowest rates available. 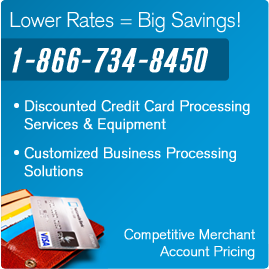 Whether you are searching for your first merchant account or already have one, we will beat all competitor’s rates. If we can’t, which hardly ever happens, we will send you $100. It’s that simple. Call to find out more at 1-866-734-8450.